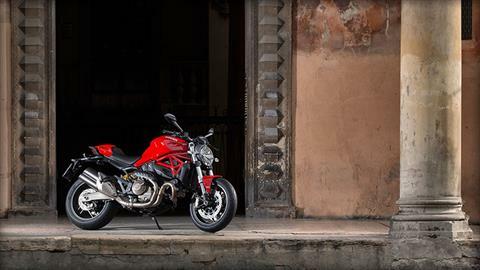 112 HP Testastretta 11° engine, razor sharp handling, state of the art safety equipment,Riding Modes and unmistakable Ducati sound. Sport performance, Italian design and unique personality: Monster 821, essentially Monster. 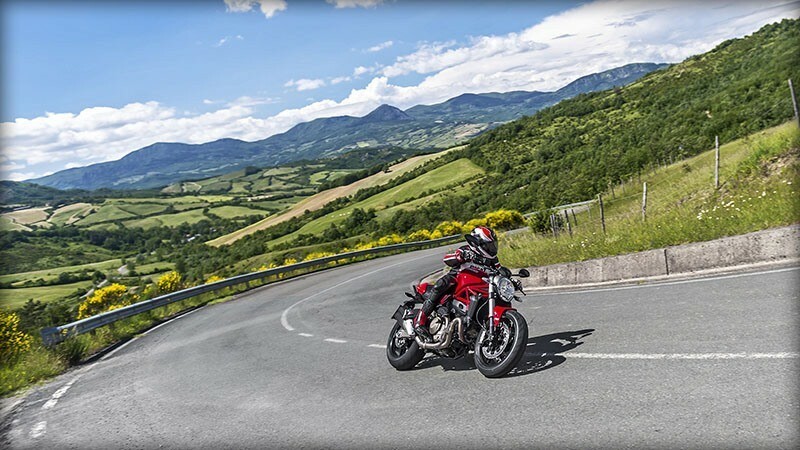 RIDE-BY-WIRE: The Ride-by-Wire (RbW) system is an electronic interface between the engine and the Monster's twistgrip, which enables the ideal power to be delivered to be set depending on the Riding Mode selected. The twistgrip doesn't have a throttle cable directly linked to the throttle bodies, but sends a signal to the control unit which, in turn, electronically controls the opening of the throttle bodies The RbW system uses three different mappings to regulate power delivery: 112 hp for a sports delivery 112 hp for a progressive delivery suitable for touring 75 hp for a progressive delivery suitable for city use. RIDING MODES: The new Monster incorporates the most innovative, state-of-the-art Ducati technology, including the renowned Ducati Riding Modes. 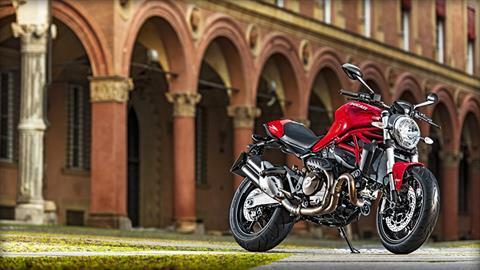 The three Riding Modes (URBAN, TOURING, SPORT) combine the leading technologies in the product class, such as Ride-by-Wire (RbW), Ducati Traction Control (DTC), and 9MP ABS with multiple settings. 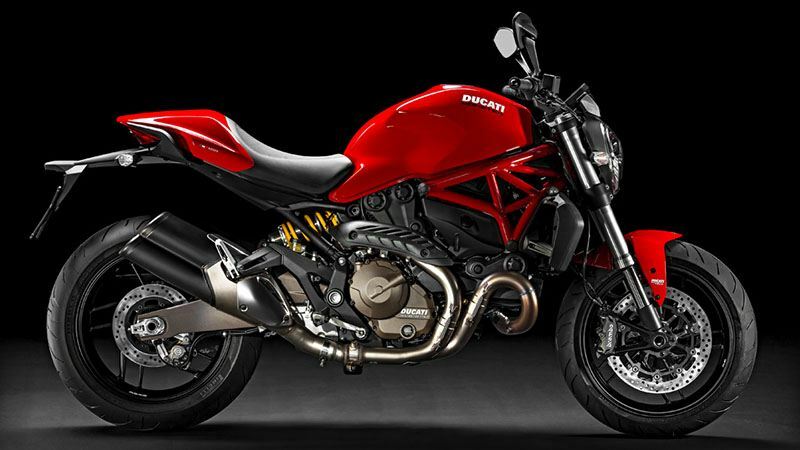 The rider can change the character of the bike by simply clicking a button, even mid-ride, choosing the configuration that best suits his riding style or the road conditions from the three different pre-set options (Riding Modes). 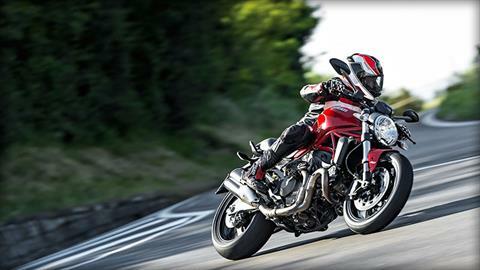 The Riding Modes allow the rider to instantly change the power delivered by the engine and the DTC and ABS activation levels. The Riding Modes are factory pre-set for each of the three parameters, but can be customised individually and saved in order to best meet the needs of the rider. The initial settings can easily be reset via the "default" option. 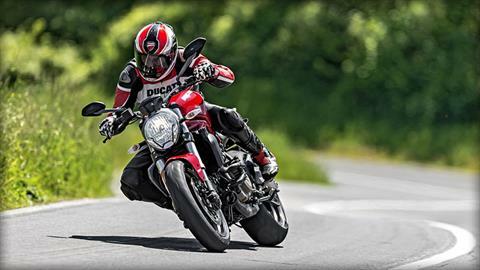 DUCATI TRACTION CONTROL (DTC): Ducati's DTC gives the rider a choice of eight profiles or "sensitivity levels", each programmed with a different wheelspin tolerance value, matched to progressive levels of riding skill, and graded from one to eight. A preset level at which DTC intervenes is assigned to each Riding Mode. When DTC is on, the control unit analyses the data sent from the front and rear wheel speed sensors, detects the amount of wheelspin, and works out what type of intervention is necessary. This intervention is carried out very smoothly by electronically slowing down the engine injection to reduce torque, until rear grip is completely restored. DTC can also be disabled by the rider. The DTC profiles are factory pre-set for each of the three Riding Modes, but can be customised individually and saved in order to best meet the needs of the rider. The initial settings can easily be reset via the "default" option.